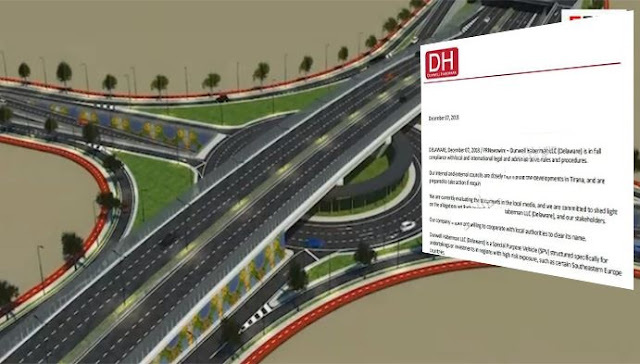 Seems that Albania is facing a new corruption scandal regarding one of the companies that has won the tender in the construction of a 2 kilometers road segment at the "Big Ring", Tirana. The Albanian company in this case operates as a subsidiary of a company registered in the state of Delaware in the United States. Dunwell Haberman operates in Albania through its domestic affiliate "DH Albania", which has won a $ 20 million tender for one of the big ring segments in Tirana. Authorities suspect this firm has committed two forgery to secure the contract in Albania. Has falsified the date of creation; in Dalaweare, the company is registered 6 months ago, on June 25, 2018, while in Albania has filed documents as if it existed since June 1998. 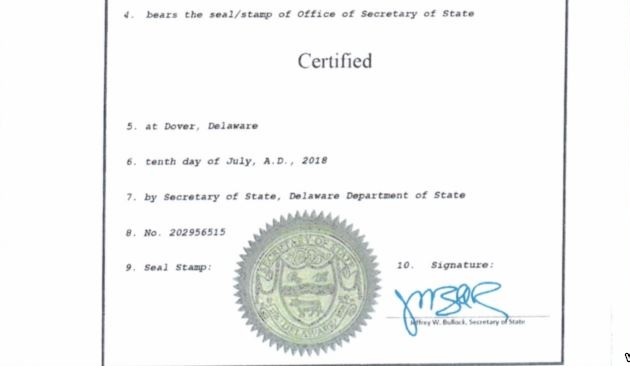 The second document, allegedly forged, is a certificate of the Secretary of State that this firm does not have fiscal obligations to the State. State Secretary spokesman Doug Denison told VOA that there was no request from the firm for the certificate and no documents were issued. The faked documents went public for the first time in Albania last night at the "Të Paekspozuarit" show on News24. According to spokesman, the case is expected to go to the criminal investigations at the General Prosecutor's Office in Daleware, headed by Matt Denn. If the authorities find a violation, the firm may be annulled as a business registration in that country and criminal charges may be raised against it. Since the company has activity in another country outside the United States, the case may also be referred to the Department of Justice in Washington. On the other hand, after the allegations of corruption, the company Dunwell Haberman LLC (Delaware) has reacted stressing that operates as a subsidiary of a company registered in Delaware state in the United States. 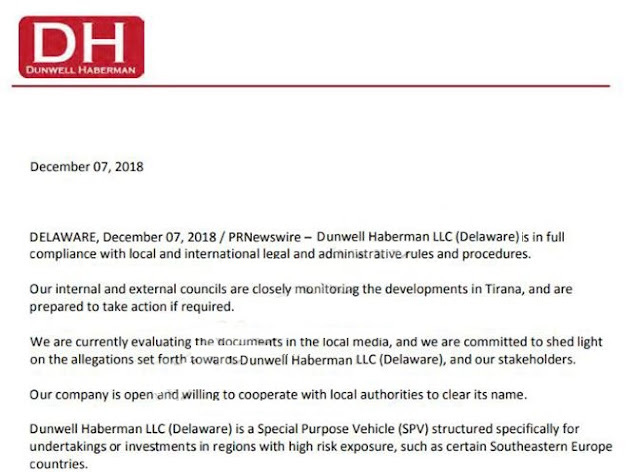 DELAWARE, December 07, 2018 / PRNewswire — Dunwell Haberman LLC (Delaware) is in full compliance with local and international legal and administrative rules and procedures. Our internal and external councils are closely monitoring the developments in Tirana, and are prepared to take action if required. We are currently evaluating the documents in the local media, and we are committed to shed light on the allegations set forth towardsOunwell Haberman LLC (Delaware), and our stakeholders. Our company is open and willing to cooperate with local authorities to clear its name. Dunwell Haberman LLC (Delaware) is a Special Purpose Vehicle (SPV) structured specifically for undertakings or investments in regions with high risk exposure, such as certain Southeastern Europe countries. " The Delaware state is known as one of the states that has favorable-corporate laws. Thousands of US companies are registered in this country to benefit from taxes. Dalaware is also known as a "fiscal paradise" as does not collect taxes from corporations that, although registered there, do not operate in this country. Under the laws of the state, the corporations registered there are not required to publish the name of the company's executives or its shareholders. In Delaware, the company's registration can be done even without being physically present and there are other firms that perform this function for the client. Based on the documents registered in this state, the firm Dunwell Haberman has been registered through the firm "Apex Resident Agent Services".